When goods are to be transported, there are many regulations that need to be followed in order to assess and classify the hazards associated with the specific material. This can be an important factor in the design and commercialization of a specific good. Slight changes in the composition of the material may not change the overall end use of the product but could possibly result in a change in its hazard classification. Fauske and Associates, LLC (FAI) has extensive experience in characterizing the explosive or flammable nature of solids, liquids, vapors and gases. With this expertise, we are proud to offer a suite of UN/DOT testing of potentially dangerous goods. 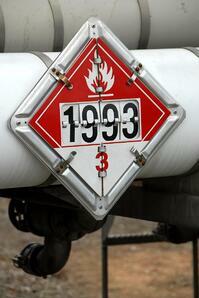 “Dangerous goods” may be pure chemical substances, mixtures, or manufactured articles. The flammable liquids classification is determined by evaluating the flash point of the liquid. The packing group is then assigned based on the range at which the flash point of the liquid falls within. The Burning Rate test is used to classify materials as “flammable solids”. The test involves exposing a powder train (250 mm x 20 mm x 10 mm) to a flame or hot wire with a temperature of 1000°C. Classification is then based on the materials burning rate. The Self-Heating Substances test is used to determine if substances are “spontaneously combustible”. The test involves exposing various quantities of sample to temperatures of 100°C, 120°C and 140°C for a period of 24 hours. During the exposure time, the temperature of the sample is monitored for exothermic activity. Classification is then based on the occurrence of exothermic activity and the size and temperature at which it occurred. The Dangerous When Wet test is used to determine if the material is capable of generating flammable gases when it comes into contact with water. This is a multistep test that involves exposing the material to small quantities of water and evaluating if flammable gases are generated. Classification is then based on the evidence of flammable gas evolution and the rate at which these gases evolve. The Solid Oxidizing Substance test is used to identify if a material is has hazardous oxidizing properties. The test involves mixing the sample with various quantities of a known combustible material and comparing the burning characteristics to that of a known oxidizer/fuel mixture. Classification is then based upon how intensely the sample burns. Results from these tests will identify if your material falls into one of these categories and, if so, the degree of danger these materials present.